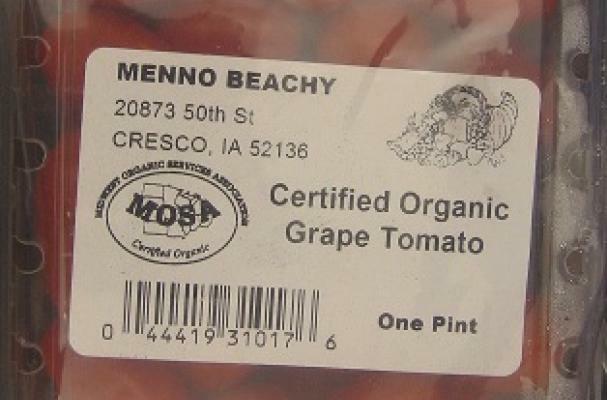 Menno Beachy of Cresco, Iowa, has recalled their one pint containers of Certified Organic Grape Tomatoes, because of possible Salmonella contamination. The tomatoes were distributed from a Minnesota location to retail stores in Minnesota, Wisconsin and Michigan between 7/26/12 and 8/6/12. The grape tomatoes are packaged in square-shaped clear plastic clamshell containers labeled as Menno Beachy Certified Organic Grape Tomato, UPC number 044419310176, with a net weight of one pint. There are no lot numbers or expiration dates on the clamshell label. The clamshell packages are distributed in cases that are printed with a lot number. The case lot numbers affected by the recall are MB725GT3, MB725GT8, and MB725GT0. For the complete recall notice, please visit the FDA website.